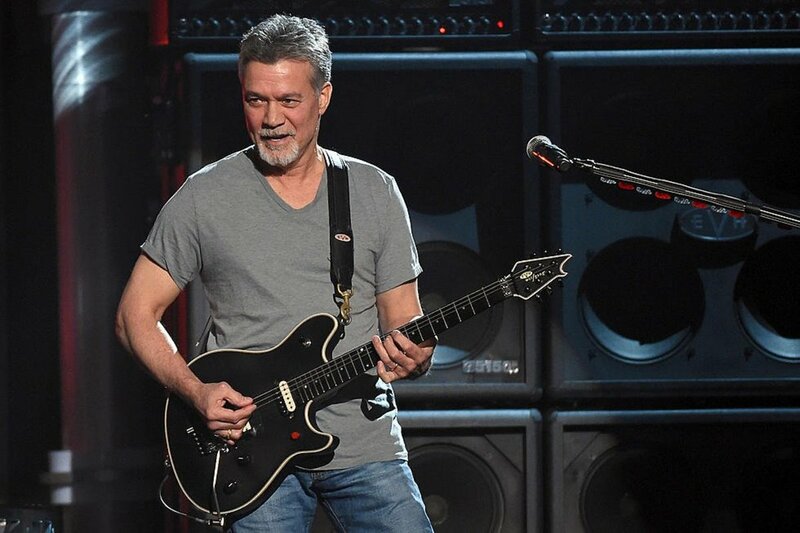 Eddie Van Halen was busy making himself one of the most influential guitarists in the world. It is doubtful he was thinking at all about selling guitars, or designing new guitars, or making new trends in guitar building. Eddie was and is a person who tinkers with things. Eddie doesn't just tinker with guitars a little. He almost never stops tinkering. What am I talking about? Oh, just how he may take parts from any five to ten guitars to build or 'Frankenstein' one together. But Eddie's Frankenstein was a guitar in a state of transition for a long long time. Keep changing parts out on a guitar frequently enough and the entire ensemble will become unstable. 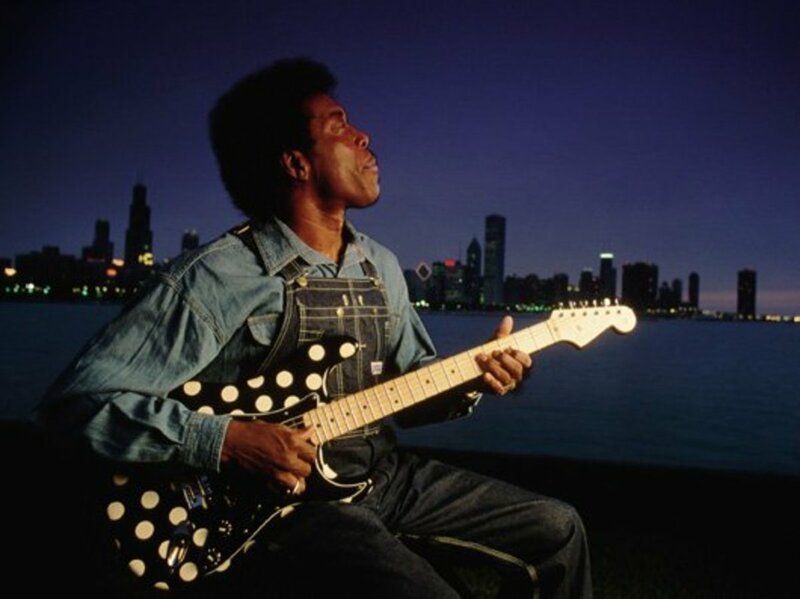 So at some point Eddie had to cease and desist with modifications of his Frankenstein Stratocaster. 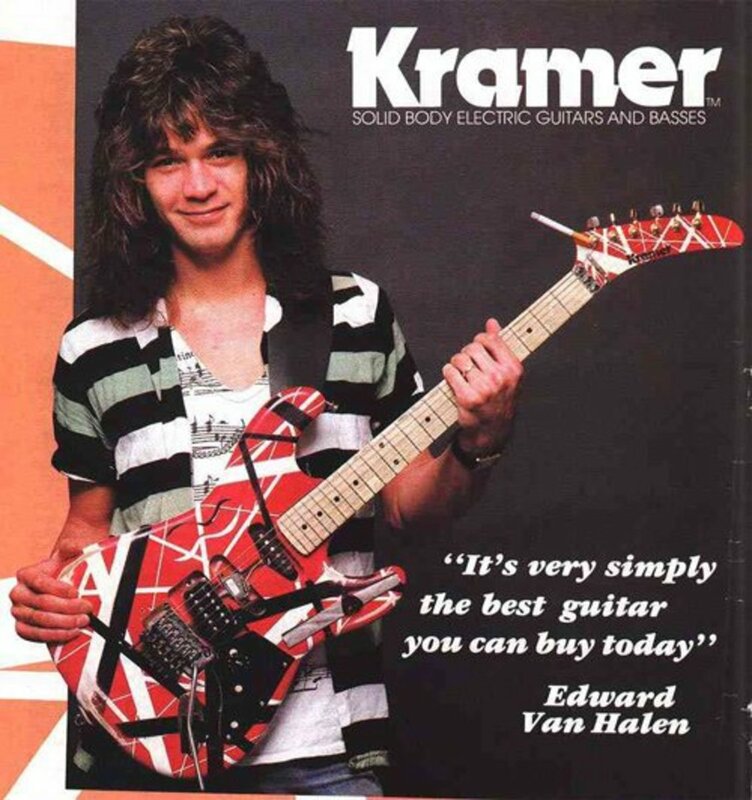 It was no big deal though, Edward Van Halen was one of the most famous musicians in the world then. Kramer built him his 'hockey sticks' guitar, and it was modeled after the Frankenstein Frankenstrat. Eddie Van Halen wasn't alone in causing the explosion of Super Strat guitars. George Lynch was playing in Dokken and doing the whole guitar hero thing at this same time. Steve Vai was Frank Zappa's stunt guitarist, and Randy Rhoads was working with Ozzy Osbourne and pioneering neo classical metal guitar. Heavy rock music was changing. Bands like Led Zeppelin and Black Sabbath were on their way out. New heavy rock or metal bands were much flashier, and had some much more aggressive guitar playing driving their sound and image. Guitar playing was becoming more competitive, and everyone wanted to be the fastest there was. Guitarist as gunslinger was the game of the day. The kind of blues licks one heard from Jimi Hendrix, Eric Clapton, Jimmy Page and others of that ilk were by then old hat. Everyone could do those blues licks, and the public ears wanted to hear something new. 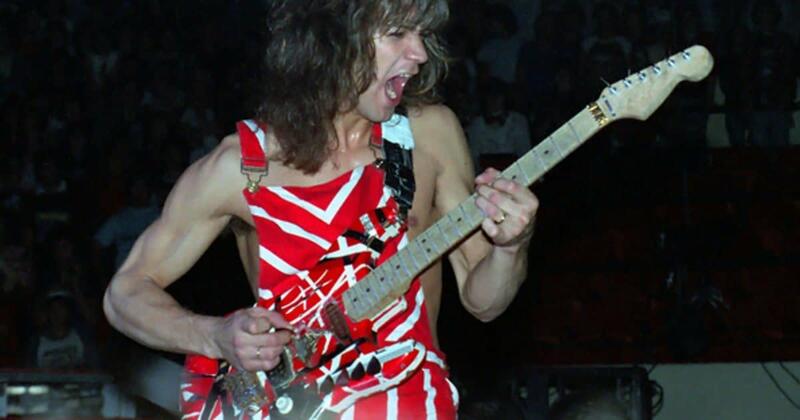 Eddie Van Halen came in and blew the guitar public's mind with two hand fret board tapping. 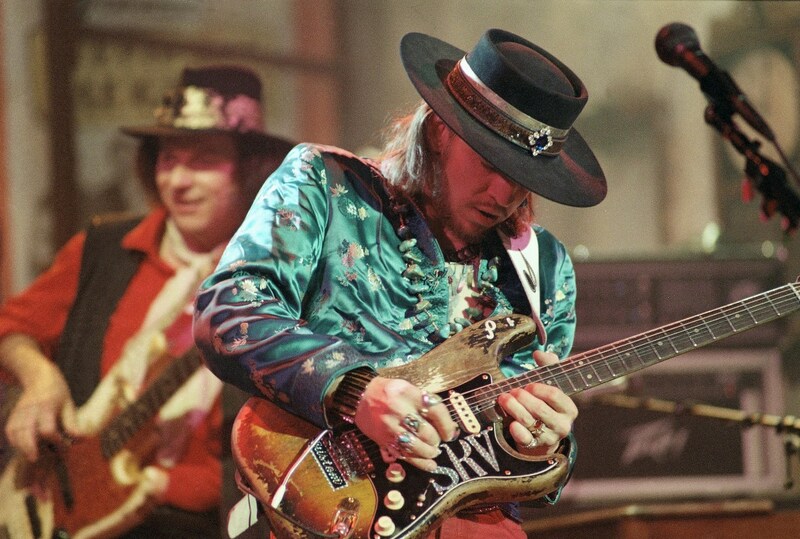 He could play the guitar at a ferocious tempo, use his whammy bar in extreme ways. His bag of tricks seemed without end. 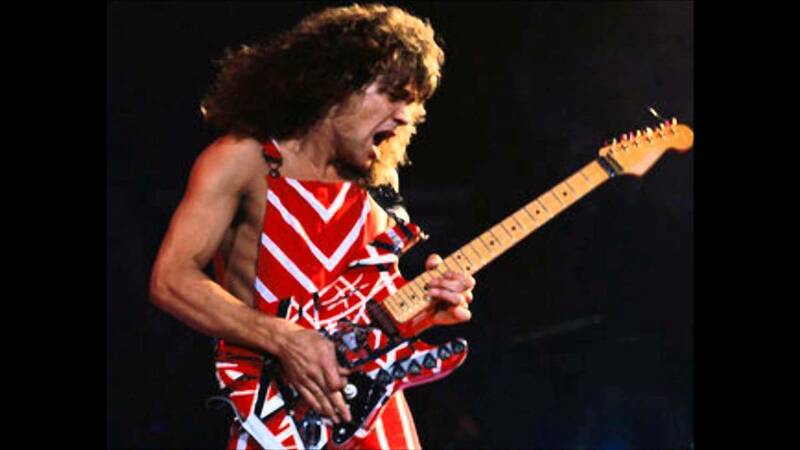 The style of playing which would come after Eddie Van Halen blew minds away with his Eruption had been brewing for a while. Ritchie Blackmore and Uli Jon Roth had hinted at it with their incorporation of classical motifs and jazz scales in their soloing. Al Di Meola and John McLaughlin along with Jeff Beck and others were already doing some heavy rock and jazz fusion. What formed was a new style of guitar playing. It was called shred or shredding, but what exactly it entailed is rather abstract. The shredding of someone like Al Di Meola was nothing at all like the shredding of Edward Van Halen or George Lynch. Then there was Yngwie J. Malmsteen, who while plainly a shred guitarist, used a very stock Stratocaster. Di Meola had no need for a super strat either, so clearly the notion one needed a super strat to shred was false, but with EVH leading the way, many a guitarist fell in line to own as many a super strat as they could afford. There is no exact definition as to what a super strat is. A super strat can be created in a huge number of ways and with a load of different specifications. 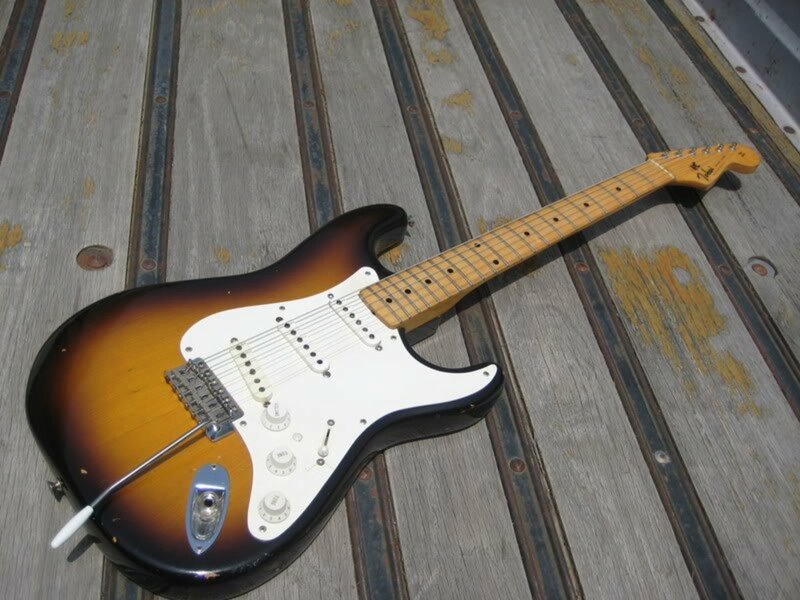 That said, a super strat is clearly a guitar based on the design of a Fender Stratocaster, but modified in such a way from the form, as to be most suitable for shred guitar playing. But we've already pointed out shred guitar playing is a fairly subjective term. So a super strat for a shred guitarist could then have any number of differences, one to another. There are, however, certain characteristics all guitars dubbed as super-strats will have in common. For one thing, a whammy bar is always a part of a super strat. A real whammy bar is something above and beyond the mere tremolo bar standard to the Fender Stratocaster. People learned a long time ago how to modify that stock tremolo bar to get a bit of double action with it. But that modified thing was very bad for keeping a Stratocaster in tune. Floyd D. Rose invented the locking tremolo bar. The invention is so well known it is often referred to as simply a Floyd Rose, even if a particular one is a design made by someone else. The lovely and ground-breaking bit of engineering and machine shop metal work was invented in 1977, and in the 1980s it would propel guitar soloing into something which had not previously been imagined. 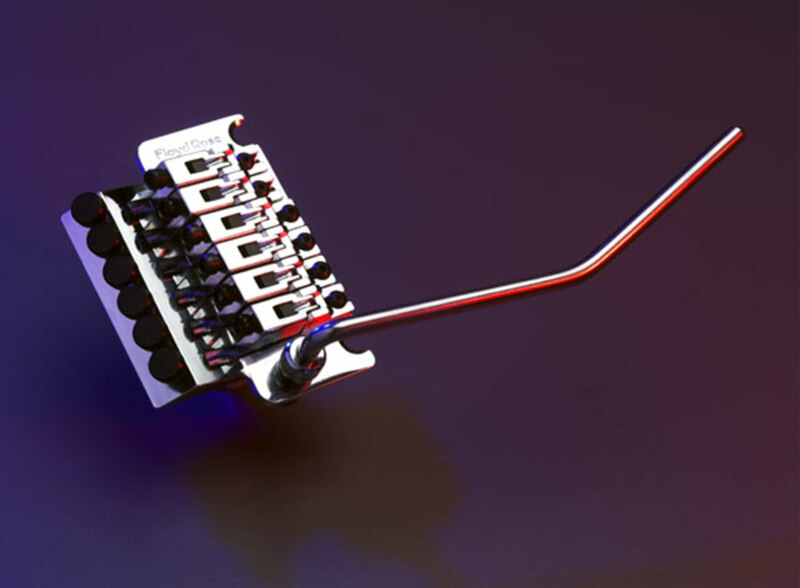 The double locking design of the Floyd Rose tremolo bar, bridge, and nut allowed a guitarist to sharply change pitch on any note upward or downward, and back to wherever it was struck, and do so without nearly so much risk of causing the strings to go out of tune. As time went on Floyd Rose produced several different types of Floyd Rose whammy bar. Each had different characteristics, and each had advantages and disadvantages. Other manufacturers were soon to make their own double action whammy bar. Schaller was the chief competition for the Floyd Rose, but there are others. So every super strat is a guitar based on a stratocaster body. Some have exact dimensional copies of a Strat body, others will have more of a Strat body, but with more pointy edges. Because having some pointy edges in a guitar body gives the thing an aggressive look, for making aggressive music, of course. And the mega modern, all bells and whistles whammy bar. 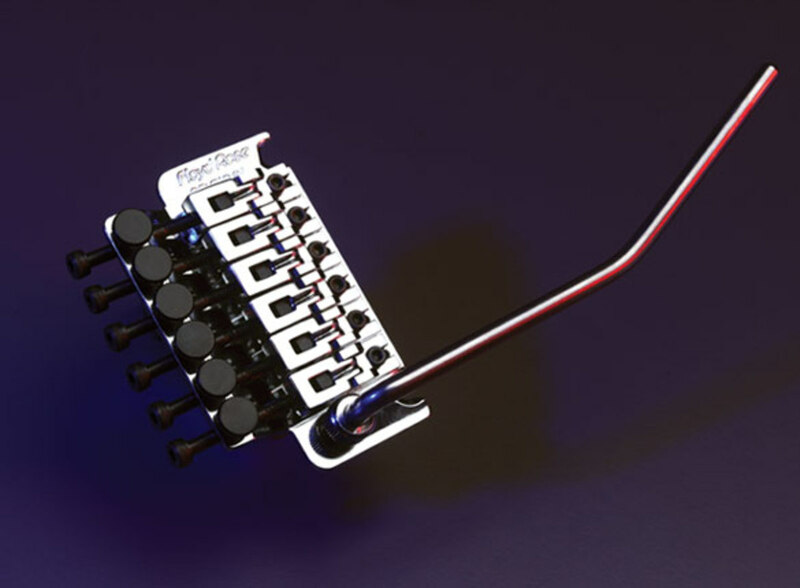 A double locking double pitch swinging tremolo bar. There must be one present for a guitar to be a Super Strat guitar. What else? A humbucker pickup in the bridge position is a must. A Stratocaster guitar is a great guitar for any sort of music, but when one is going for a really heavy blues or hard rock, or heavy metal sound, you want a humbucker pickup in your bridge position. You get a thicker tonality. A lot more crunch for your power chords. After a humbucker in the bridge position, the pickup configurations could be anything. I suspect the most Super Strats, however, came in an HSS pickup configuration. The EVH Frankenstrat was the essential blueprint for the extremely modified Strat, or Super Strat. But as time went on, and more and more of the hottest guitarist adopted their own versions of Super Strat, additional options came into play, and became elements one looked for when seeking to purchase their most ideal guitar hero's ax. Another of the features a Super Strat may or may not have is a longer fretboard. What I mean is additional frets. The Strat comes with 21 frets. A Super Strat may have as many as 24 frets. Shredding as a style of guitar playing is something often utilizing the highest register of notes. Uli Jon Roth was having guitars built with more than 24 frets. But those guitars are something else entirely. So here we will discuss more than 5 total guitars. But the goal here is to give the reader some information they may have not had. And to provide some choices for prospective Super Strat buyers. The guitar also has a graphite-reinforced quartersawn maple neck with a hand-rubbed oil finish and thumbwheel truss rod adjustment, compound-radius maple fingerboard (12”-16”) with 22 jumbo frets and black dot inlays, and a single ferocious direct-mount Wolfgang humbucking pickup. When it comes to guitars where there are only one exact complaint about, look no further than Suhr guitars. The complaint? The price, of course - these are no cheap instruments. These are cream of the cream instruments, and only for those who can afford to have them. They won't loose value, and they won't disappoint anyone in any way at all. Everything on a Suhr is done with the utmost attention to detail, and with the finest possible materials. Everything is above and beyond in beauty, and play-ability will be such that even a lesser skilled guitarist can transcend himself, and produce tonal flares of gorgeousness galore. You may think I'm gushing. But have you laid hands on Suhr guitars? I have, there are none finer. There can be none finer, only others which can compete, and those are few, then the rest of the guitar manufacturing world. Suhr guitars are visually stunning. But there is much more than mere visual aesthetic appeal here. A blind man would know right away a Suhr is superior to almost anything else he or she had laid hands upon. The craftsmanship here is stupendous. The price is not bloated, not inflated, and is altogether reasonable, though high. The visual appeal here is tremendous though. We shouldn't make any bones about that. Eddie Van Halen never plays guitars this beautiful, and it is a good thing too, he can't keep his tinkering hands off of them. These guitars, with flamed tops, are too beautiful and too costly for someone to go mucking about with modifications. These Suhr guitars are all born perfect. But Suhr makes many more Super Strats than the Custom Standard Super Strat. 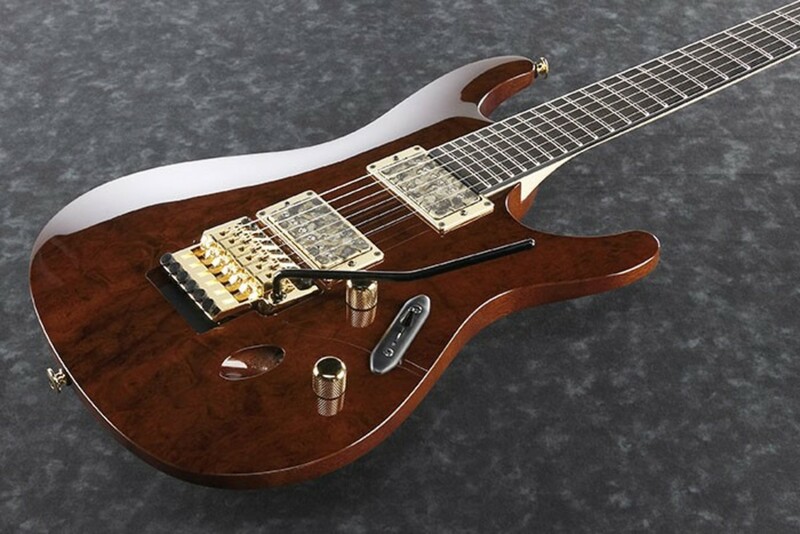 The Suhr Carve Top Standard would be another example, a very different guitar. Also very very expensive. But for the purposes of this webpage, the Suhr Modern Satin is the stealth shred machine we will focus on. Because it is everything you love about Suhr, and more affordable than the others. For many years now Ibanez has been one of the dominant players in the solid body electric guitar market. There are as many heavy metal guitarist playing Ibanez as their number one choice as there are those playing Fender or Gibson. It goes without saying how and why this is. 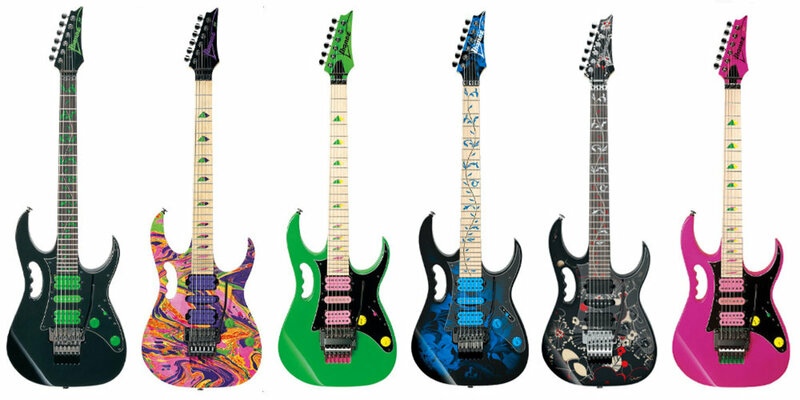 Most of the Ibanez artists are heavy metal guitarist and or shredders. These Ibanez instruments were as often as not what one would clearly refer to as Super Strats. Steve Vai very often if not always is seen now playing an Ibanez. He's been doing so for quite some time. This is a $2,500 dollar guitar. And it competes directly and appropriately against more expensive American made instruments like those from Suhr. When it comes to a person who is a serious amateur and maybe even sometimes plays professionally - I make no judgements as to whether buying American is superior, as the musician has a job to do and a budget with which to acquire his or her tools. 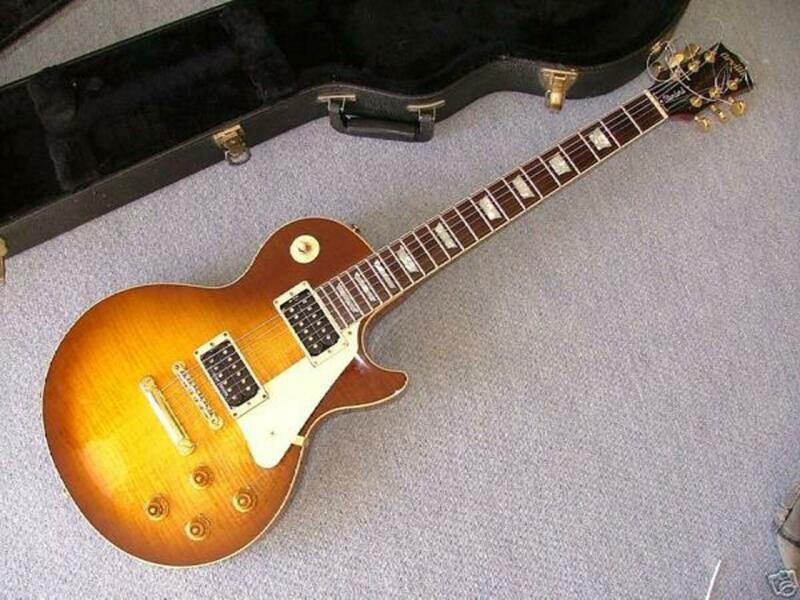 Every guitarist wants the absolute best guitar they can get for the money they have to spend. If you are into hard rock or any genre of metal, this guitar is something you should absolutely check out before you buy another. Variety of woods used from Basswood to African Mahogany. In 1980 Steve Vai was just 20 years old, and recognized globally as one of the hottest and most technically astounding guitarist alive. He'd been working for Frank Zappa for two years already, but now he was a member of one of the most demanding musical outfits anywhere. He'd spend three years with Zappa, then go on to solo recording. A highly individualistic man and musician, Vai has never stopped playing, performing and teaching. His Passion and Warfare album was considered the finest guitar virtuoso work of the 1980s, a decade where guitar gods were some of the biggest entities in all music. Is it any wonder that when David Lee Roth parted from Van Halen, he chose Steve Vai as his guitarist? He's won three Grammy awards, and starred as the devil's guitarist in a popular film about a popular folk motif, Crossroads. Vai's philosophy of learning and performing a piece of music is unstoppable. He figures that were a thing played slowly enough and to perfection, it could always be brought up to speeds to where it appeared to be a thing impossible to execute. Well, Steve does just that over and over again. But he is also known for his stern discipline. Ten to fifteen hour days of guitar practice - that's what it takes to be a Steven Vai. An uncompromising person. Vai had a guitar designed for him and him alone by Joe "Jem" Despagni, a custom guitar luthier But no one would mass produce such a thing until Ibanez came along and offered their services. Originally there were 777 of these made, but there are many more of them available now. There are several varieties of Ibanez JEM available, and there is also the much more affordable Ibanez JEMJR, which goes for under a thousand dollars. All of them are good to great shred moster Super Strat guitars. The Ibanez JEM has been in steady production since its debut in 1987. Because there are so many Ibanez JEM guitars produced, and there are a lot of variety with them, I'll display specifications for one alone. The JEM7V is not one of the least of them, but is not the most expensive one either. There has never been a better time to buy a guitar than right here and now. The level of production standards are higher than ever before. And the competition has never been so stiff. In high end Super Strat guitars, Tom Anderson is a one to beat. Or a one to just admire and drool over. Tom Anderson Guitars make some of the most beautiful guitars on the planet. But they're tools with utility beyond mere beauty. The Tom Anderson Angel is aptly named. For its beauty is angelic. Tom Anderson Guitars makes more Super Strat models than just the Angel. But I've chosen the Angel here as it seems to be based in part upon the idea of the Steve Vai Ibanez JEM. The shape is off-Strat, and the Angel is a HSH pickup configuration, and a 24 fret neck. So what you have is something more beautiful than the JEM, and without that goofy handle on the body, which may or may not freak you out completely. 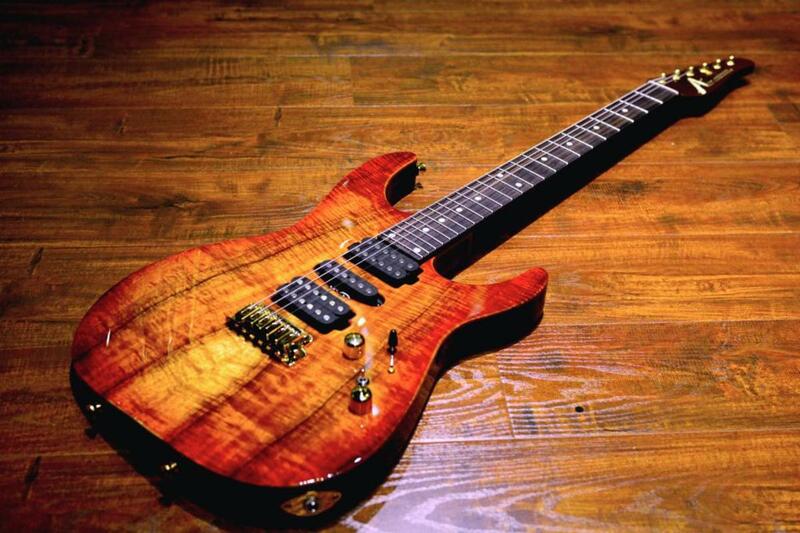 And with the Tom Anderson Angel you get one amazing flame or quilted top and finish. The Tom Anderson Angel guitar is not cheap. We're talking $3,000 on up to $4,000. The ones which cost the most are only the more beautiful visually. A blind man would rarely be able to tell the difference between one and another. But he'd sure know he was holding a masterwork of a guitar in his hands. Thanks Kevin, for giving me something to look up. I've probably got an old guitar magazine somewhere with, possibly, an advert or bit of review of it, but off the top of my head, it's new information. It's a top 5 article, Mark. Can't list them all in a top fiver. There are a lot of awesome Jackson guitars that fit, but whenever a Top 5 thing is done, some very great ones wind up getting left off. It's possible I get bored and change the article to a top 10 sometime. Jackson not on the list?!! !